Having already achieved a recorded average speed over a measured mile of 308mph in the late afternoon of Thursday 17 August, the JCB DIESELMAX needed to complete a second run within a twenty four hour period at least matching this speed in order to take the record. Today the second run was completed successfully achieving an average speed of 325mph. 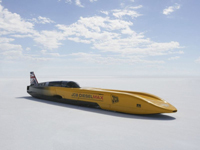 The average speed of the two runs was thus recorded as 317.021mph, thus establishing the JCB DIESELMAX as the fastest-ever diesel over the Bonneville course. “Establishing a new Bonneville course record in excess of 300mph is a major achievement for the team and demonstrates the power and capability both of the vehicle and its Ricardo-developed JCB444-LSR engines”, said Ian Penny, Ricardo director of diesel engineering. “We have every confidence that the JCB DIESELMAX has the capability to take the official international FIA record in the next few days and the Ricardo engineering team on site at Bonneville will be working flat out to ensure that the engines they have developed will perform to their full potential”. Having achieved the course record, the JCB DIESELMAX team will now prepare the vehicle for its official FIA record attempt. This will entail the replacement of the engines with two new units which have been certified and sealed by FIA inspectors at Ricardo’s Shoreham Technical Centre prior to shipment to Bonneville. For the record attempt the JCB DIESELMAX will need to complete two runs within the space of one hour from entry of the measured mile on the first run to exit on the second.